Abnormal posture and muscle imbalances are widely regarded as primary sources of neck pain. 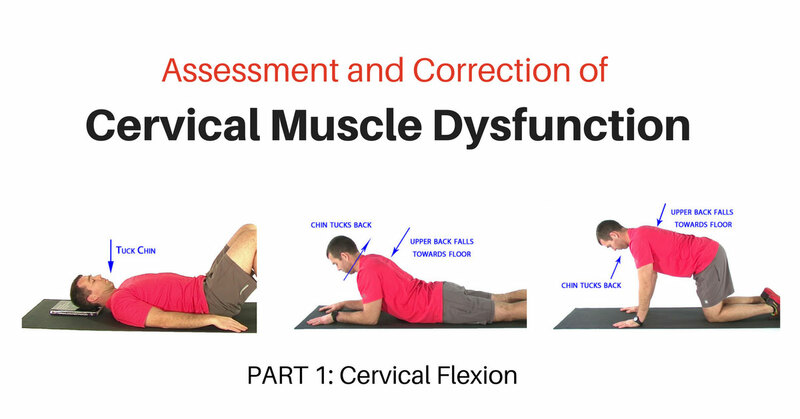 This three part series will discuss assessment and corrective exercise recommendations for some of the most common muscle imbalances and movement faults affecting the cervical spine. 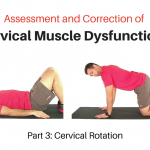 In this first article we will discuss the cervical flexors. Subsequent articles will cover the extensor and rotator muscle groups. The cervical muscles can be divided into intrinsic and extrinsic muscles. The intrinsic flexors are collectively referred to as the deep neck flexors (DNF). They include the rectus capitus anterior and lateralis, as well as the longus capitus and coli. These deep muscles possess joint-to-joint attachments. This architecture allows for precise control of vertebral posture and movement. In contrast, the extrinsic flexors (primarily the SCM, but also the anterior anterior and medial scalene) are longer muscles located more superficially. They are better able to generate greater forces with movement or postural demands. However, they are not well suited to control inter-segmental motion. Under normal circumstances the intrinsic and extrinsic muscles work synergistically. However, it is common for the intrinsic flexors to become weak or inhibited. When this happens the extrinsic flexors become dominant, leading to abnormal movement and alignment of the cervical spine. We can test the cervical flexors with the Head/Neck Flexion test. From the supine position simply instruct the patient to bring their head towards their chest. During the movement we want to look for 3 things. First, what is the global ROM? Under normal circumstances the chin should reach the sternal notch. If AROM is limited check the PROM. 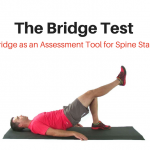 This can help determine if the limited range is due to tight extensors or weak flexors. Second, what is the quality of the motion? When the deep neck flexors are functioning properly neck flexion should be initiated from the top down. In other words, the head and upper cervical spine should flex first followed by the lower cervical spine. At the top of the motion there should be a relatively smooth curve indicating all the segments have contributed to the motion. When the extrinsic flexors are dominant the chin will translate forward instead of tucking in towards the neck as the head lifts. Be sure to look for this pattern as the patient lowers the head back down too. Often the first half of the test will be normal but then the chin will protrude during the eccentric phase. 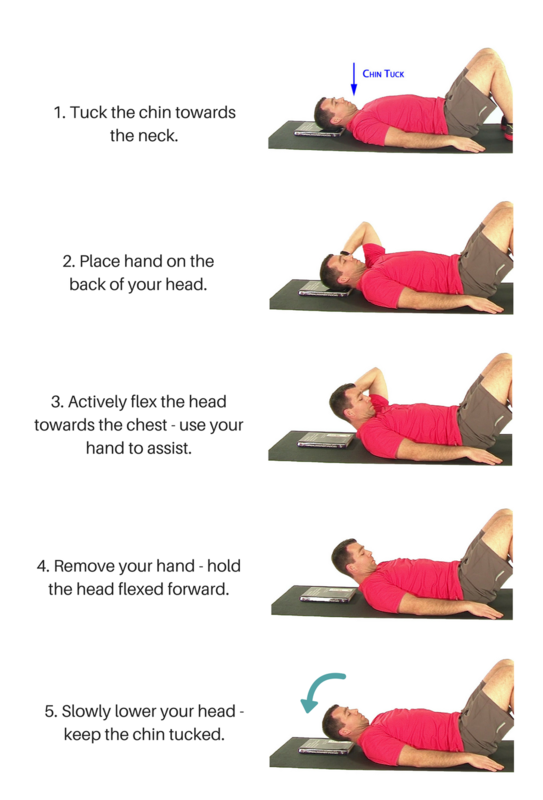 Third, test the strength of the cervical flexors. From the flexed position gently press the forehead into extension. The patient should be able to resist this pressure. If the chin protrudes or the patient cannot hold the flexed position it’s a sign of dysfunction. Failure of any portion of the Head/Neck Flexion Test is an indication of cervical flexor dysfunction. 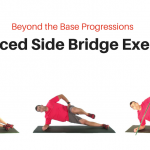 The following exercise progression is a great option to include in the treatment process. To re-train the deep neck flexors the first step is to groove the basic movement and muscle activation pattern. This is a critical step. 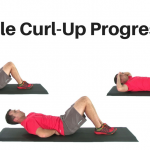 Otherwise the offending muscle pattern will carry over into the more advanced strengthening exercises. Begin in a hook lying position. With anterior head carriage and thoracic hyperkyphosis (which will be the majority of these patients) the neck will have to hyper-extend to bring the head to the floor. To prevent this place a book under the head (larger postural distortion will require a thicker book). Now teach the patient to tuck their chin in towards their neck. The key here is not to lift the head off the book. Focus on feeling the back of the head slide up the book and the back of the neck “get long”. Hold for a few seconds then slowly release the position. Repeat the motion 10-15 times. This motion will create flexion of the upper cervical spine along with some posterior translation of the lower neck. Some patients may find it helpful to press their tongue into the roof of their mouth as they do this. When done properly this movement should create a muscle contraction deep on the front of the neck. This often feels like something is caught in the throat. 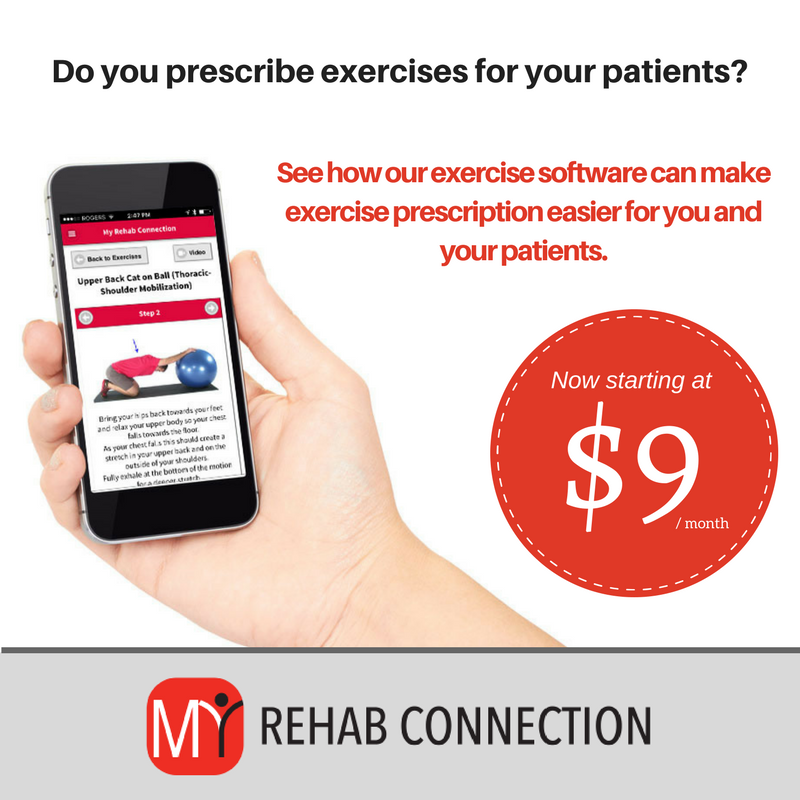 Have the patient focus on how it feels to activate these muscles. This keeps them engaged during the exercises, and will help set up the next progressions. One of the most common findings with the Head/Neck Flexion Test is early upper cervical extension during the eccentric phase. This next exercise is one of the best ways to correct this fault. 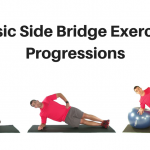 And like a lot of eccentric exercises it is a nice bridge between the fairly easy basic exercise of learning/grooving the motion and the more challenging exercises involving full active range. Begin by tucking the chin. While holding this retracted position the patient will flex their neck to bring their chin towards the chest. It is best to visualize the chin curling towards the top of the sternum. But the patient will use their arm to assist the motion. This reduces some of the demand on the deep neck flexors which may not be strong enough at this phase to perform this movement on their own. It also helps to ensure full cervical ROM. From the top of the motion remove the hand from the head so the neck is held in flexion with an isometric contraction, The neck is then slowly lowered back to the floor. During this eccentric phase the chin must stay tucked in towards the neck. Cue the patient to visualize sliding the chin up the neck as they lower the head. This will ensure activation of the deep neck flexors during the movement. This final exercise is similar to the previous Active-Assisted version, but now there is no assistance provided by the arm. The movement is performed actively. The key motions are the same. Tuck the chin to begin to engage the deep neck flexors. Focus on holding this tucked position for the concentric, isometric, and eccentric phases of the exercise. 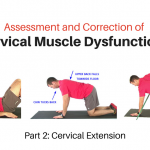 This article has discussed key exercises to retrain the cervical flexors. But the neck also relies upon the cervical extensor and rotator muscle groups for optimal movement and stability. That will be our focus in Parts 2 & 3 of this article series.